Anatomy: Muscles located in the shoulder is called the Deltoid. 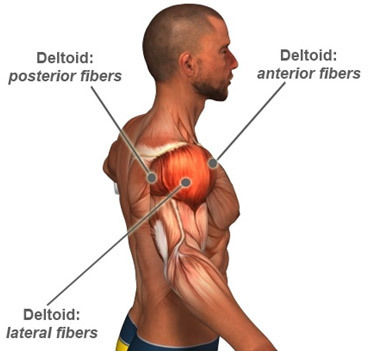 The Deltoid gets its name from “Delta” means “triangle”. The deltoid is the triangular-shaped three head muscle that covers and caps the shoulder. 1. Anterior head located in the front of the shoulders. 2. Posterior head located at the back of the shoulders. 3. Lateral head located between the front and rear heads. Important small muscles that surround the shoulder joint are called the Rotator Cuff muscles. They are the key in keeping the joint functioning properly. A strong rotator cuff muscle provides stability to the shoulder. Shoulders muscles cover the front, back and side, so they don't have an opposite muscle group. However, many other muscle movements such as those of chest and back do involve the shoulders. What Does The Deltoids Do: The deltoids are among the most important muscles you use in your daily life. These muscles are solicited in almost every movement of your arms involved in pulling, pushing or raising motions. They have the greatest range of motion. The function of the Deltoid muscle is essentially to move the arm away from the body. The Anterior head raises it away to the front or pushes something away from you, the Lateral head away to the side or raising something up to the sides of your body and the Posterior head away to the rear or pulling something towards you. There are many daily activities that use the shoulder muscles: stretching upon awakening, painting, waving, moving around heavy objects, lifting groceries, household chores, picking your kids etc. The shoulder muscles connect to the arm, neck, and back to provide stability and support for the shoulders, upper limbs, neck and head. Why Training The Shoulder Important: The shoulder is the most moveable and most unstable, vunerable joint in the body. The “ball” in the upper arm is actually larger than the socket that holds it, and with the range of motion being so great, it is susceptible to injury. To remain stable, it must be kept in place by muscles, ligaments and tendons. By doing proper shoulder workouts, these soft tissues can be strengthen and help keep the shoulder strong, flexible, more coordinated and stable. However, you really need to watch your form when doing shoulder exercise to avoid injury. Training all parts of shoulder muscles when done in balance with upper back training can help improve the postural alignment. 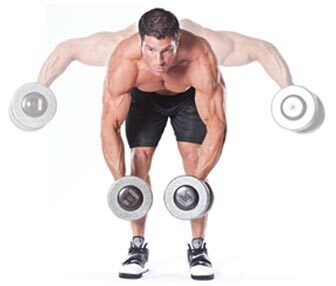 Strong shoulders also help prevent injuries when engaged in any sports like tennis, basketball, golf or swimming. Broad Shoulder In Men: Broad shoulders are one of the most masculine traits that a man could possibly have. Unlike most muscles, broad shoulders show even when they are fully clothed! Wide shoulders make a man look strong and confident and combined with a narrow waist create that V-shaped look of man’s upper body. Therefore, if you want that sought after V-taper, working on shoulders is very important. Benefits Of Shoulder Training For Women: One of the hottest body parts a woman can flaunt, in a tank-top or strapless dress, is a pair of strong, defined shoulders. Shapely, rounded shoulders give the appearance of a slim waistline and hips. Strong shoulder will give good posture making them look taller and leaner. As the most moveable and unstable joints in the body, shoulders require strength for good posture and upper body support. Women should be lifting weights to get these strong, sculpted and fit shoulder muscles. The most obvious benefit of training shoulder is improved strength, stronger bone, improved stability in the arms, and decreased risk of injury during activities like swimming where you use arms and upper body. 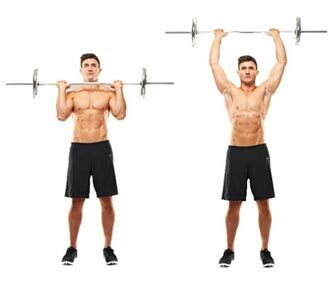 The most notable shoulder exercises are: Military Barbell Press, Dumbbell Press, Shrugs, Dumbbell Lateral Raise, Dumbbell Front Raise, Upright Row, and Bent Over Lateral Raise.